Views of the south end and east side [Photo 6] and the sound end [Photo 7] of the Trzebinia crematorium in 1945. There is a door in the south end and two windows in the east side. Very little of the corrugated iron roof remains. 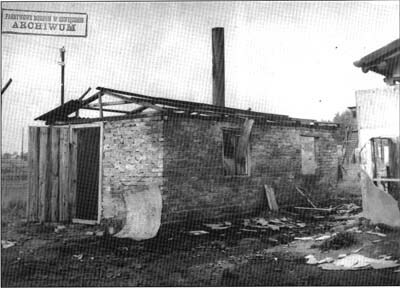 The damage to the building is no doubt due to the fact that the Germans, after blowing up the furnace, threw into the building another grenade which exploded near the furnace. 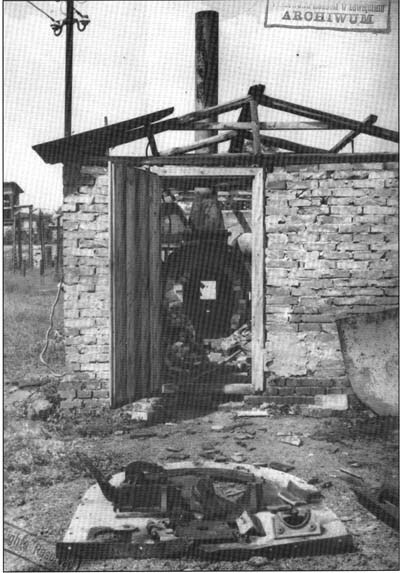 In the foreground of Photo 7 is the badly damaged front plate of the Kori furnace, which was blown out by the first explosion and subsequently dragged out of the building. Also on Photo 7, among the debris just inside the door it is possible to see the “handle end” of the corpse loading stretcher. Above the southwest corner of the building is the pole carrying the electricity supply for the blower motor. On the left of Photo 7, and between the crematorium and the latrine hut on Photo 6, is watchtower 3 in the northwest corner of the camp.